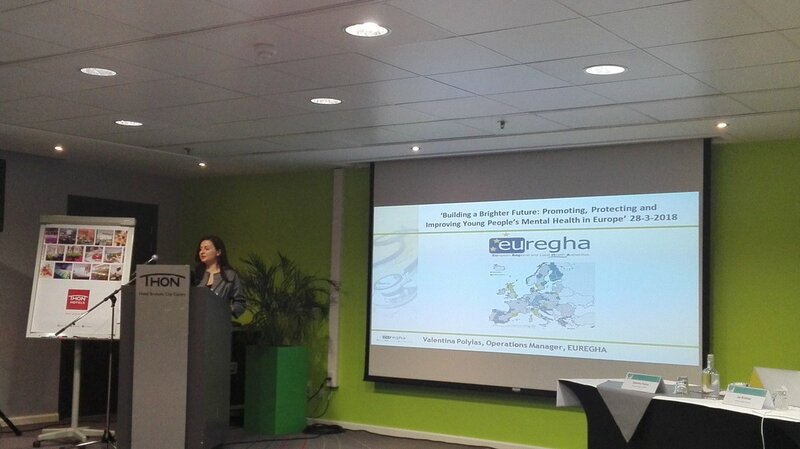 On 28 March 2018, EUREGHA presented the BOOST project at the Public Policy Exchange event on the promotion of young people’s mental health. The event focused on mental health policies for young people at EU level and best practices in the field of prevention and early intervention. Distinguished speakers set the context for discussion and shared good practices in the field. Panelists emphasized that mental health is a human right and that it is as important as physical health. The importance of the deinstitutionalization process was also mentioned as a means to avoid the segregation of people with mental issues and integrate them into society. Among the many frameworks acknowledging the importance of mental health, the United Nations’ Sustainable Development Goals (SDGs), SDG 3 in particular, and the European Pillar of Social Rights can be beneficial tools for the promotion of mental health worldwide. All speakers agreed that mental health is a cross-cutting issue which must be tackled across different policy areas. Among the many good practices and innovative approaches to support young people’s mental health in family, school settings, and the workplace, Ms Valentina Polylas, EUREGHA, presented the BOOST project. BOOST is an Horizon 2020-funded project aiming to build social and emotional skills to BOOST mental health resilience in children and young people in Europe. Social and emotional skills are key to promote mental health and wellbeing and many school-based Social and Emotional Learning (SEL) programs have proven effective in increasing social well-being and academic achievement in children. However, a number of shortcomings have been identified in these programs. One criticism is that they are time-consuming and compromise academic teaching time. Furthermore, they are often implemented by external experts, and not by the regular schoolteachers, and as such are not integrated into general teaching. These elements may compromise the programs’ sustainability and long-term effect. The project will address the issue by developing a new approach integrating social and emotional learning (SEL) programs in teachers’ pedagogical skills and classroom interaction and designing a tool for organizational development to facilitate implementation and uptake of the approach in classrooms, schools and among school owners. This holistic combination of teacher’s empowerment and organizational development will go beyond the current models for social and emotional learning (SEL) and will be referred to as the “BOOST approach”. During the dissemination event, the social media activity of the BOOST project was officially launched. Follow BOOST on Twitter at @BOOST_MHealth and on Linkedin at BOOST project for further information on developments and results as the project unfolds.